I've been saving for a new wheel. Not that I don't love my very old second (maybe even third or fourth) hand Ashford Traditional, but it's only got one speed and I hear all these neat things about ratios and wheels with greaseless bearings and smooth pedal action that I really think would make my spinning more fun. Don't get me wrong, my dear Ashford Traditional, I love the dead spot you have at the top of your wheel that I makes me have to pedal quickly to keep you from stopping and that if I want to make a high twist yarn that I have to pedal like a hamster on speed in his exercise wheel. But a new wheel would be nice. However, I kind of blew a hole in my savings this past week by purchasing the Sushi Club from Natchwoolie. Why Sushi? Because it's raw fiber from the animals Brenda raises. 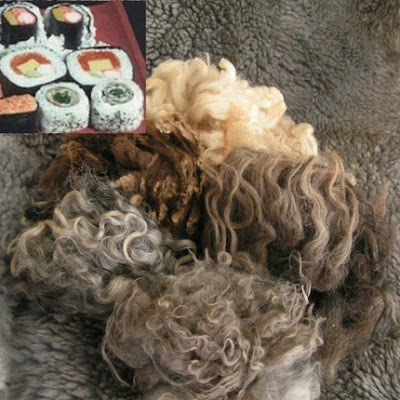 "Make It RAW" receive 4 ounces of a different color or type of raw fiber or fleece each month of the year. We raise all kinds of fiber bearers....alpacas, llamas, cotswold, shetland and merino sheep, angora goats and angora rabbits in many different colors so you never know what you might get. It will be lots of fun when you get your fluff. This is for raw fiber right of the animal and is not scoured or washed. I'm so excited! I need more fluff in my stash like an extra ear, but I can't wait for my first shipment to arrive! and the second... third... excitement all year!!! more fluff is definitely good !